Ami grindcore heavy weight will play OEF finally!!! BLOODY PHOENIX is another band that fully adore motto SHORT, FAST and LOUD, totally storming songs that will grind everything!!! 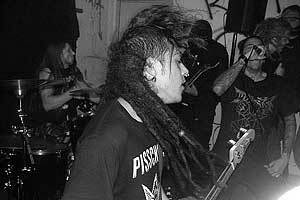 Pitty, that this band from California is not so well-known in grindcore scene as they really deserve attention because they play really intense musisc that we all, grindcore fans, are dreaming about. All of us who could see B.P. on their first European tour can swear that they're also a superb live act, get ready and give them chance to convince you about this fact at OEF this year!!! Bloody Phoenix is from Los Angeles, California. Formed in October of 2001. The band has gone through numerous line up changes in it's history. Bios & self descriptions are things Bloody Phoenix are not good at or care about. The music is pissed & violent. 2010 Bloody Phoenix/Question split 7"
2009 BLOODY PHOENIX/Black Hole of Calcutta split 10"